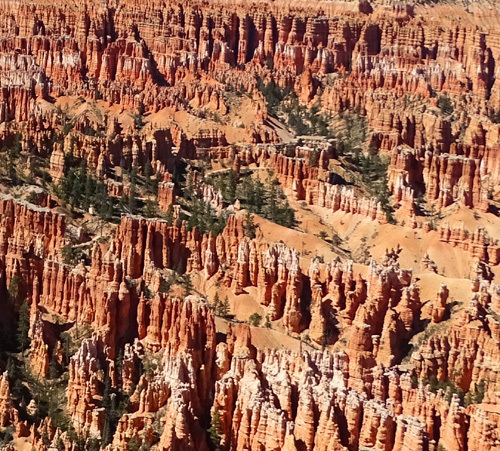 seemingly unreal landscape from another planet." 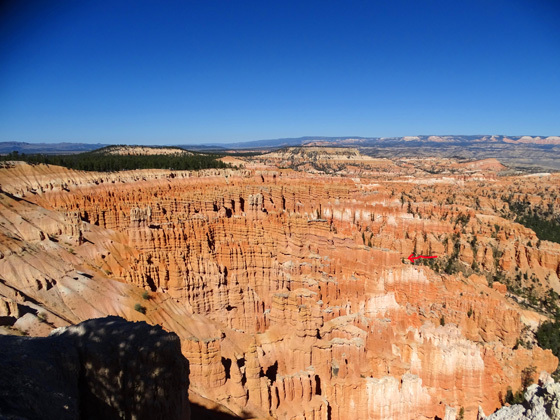 Those fascinating amphitheaters are what every visitor to Bryce Canyon comes to see! 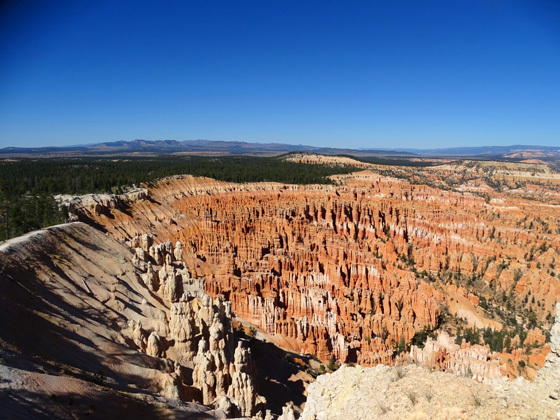 Most observe the rock formations in the canyons from the "rim," or edge of the cliff above the amphitheaters. 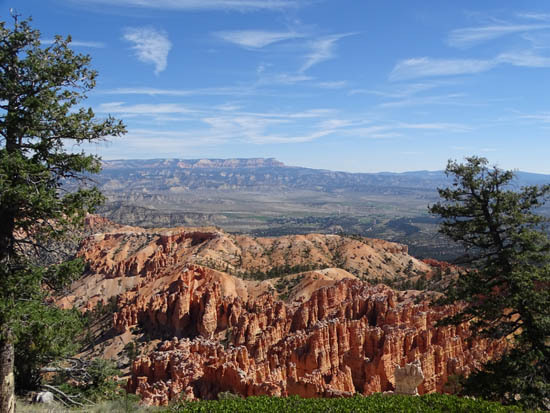 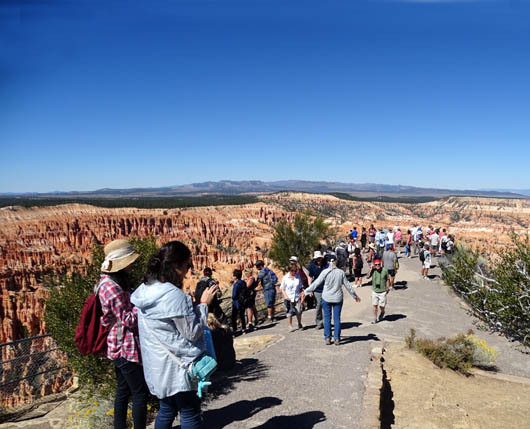 There are five very popular observation points within the first three miles of the entrance gate that overlook the largest, most elaborate amphitheaters (Fairyland, Sunrise, Sunset, Inspiration, and Bryce) and ten more distant overlooks on the Southern Scenic Drive. 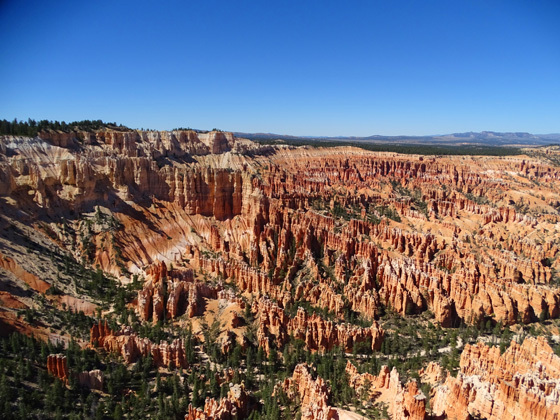 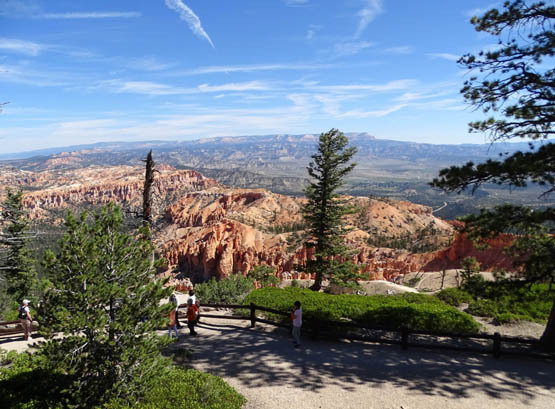 As noted in the last entry, visitors can either drive their own vehicles to all of these overlooks or use the free shuttle bus system to access Sunrise, Sunset, Inspiration, and Bryce Points. 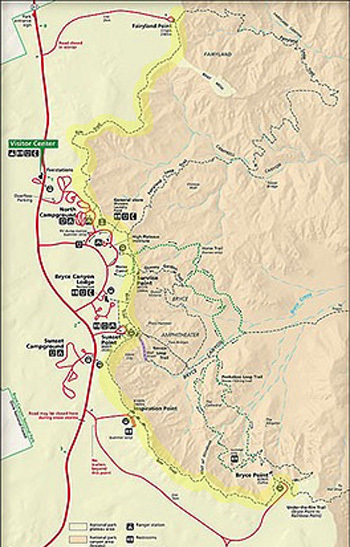 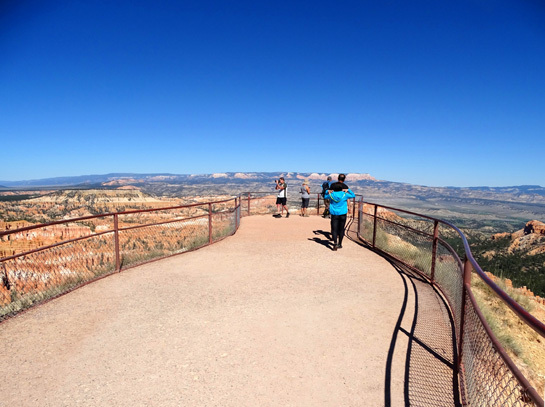 This multi-page entry shows scenes from the Rim Trail and almost all of the park overlooks, starting with the most popular ones above the main amphitheater. 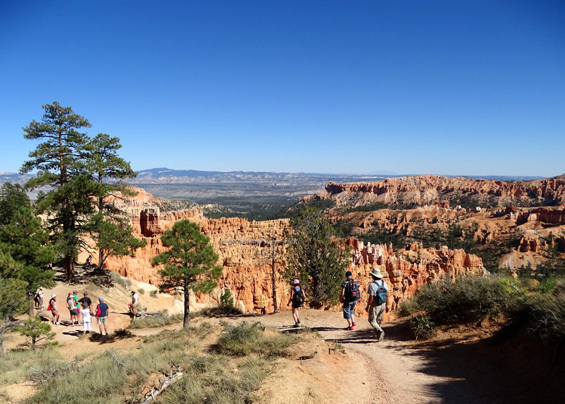 A wide walking path extends at or near the edge of the plateau rim from Fairyland Point to Bryce Point, a distance of 6+ miles. 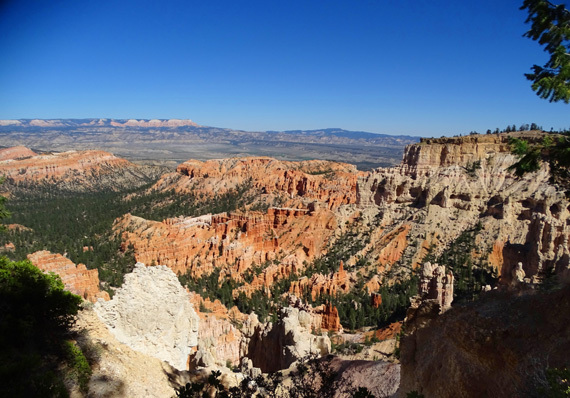 It can be easily accessed from Fairyland, Sunrise, Sunset, Inspiration, and Bryce Points, as well as North Campground and the lodge. 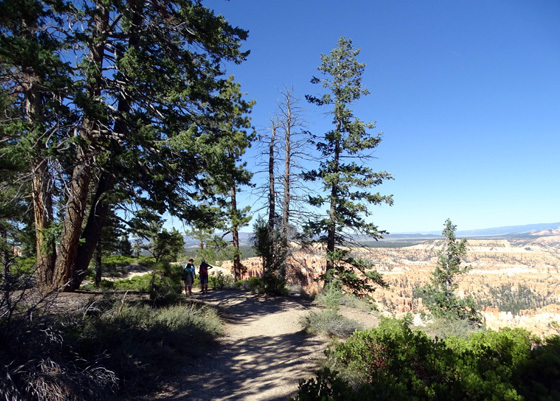 The majority of the trail is dirt and it undulates between observation points, sometimes rather steeply. 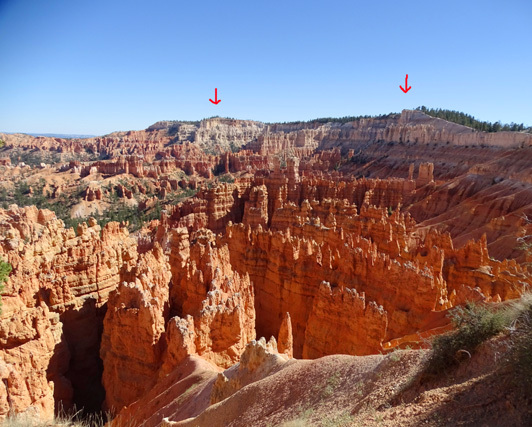 It is often quite close to the edge of the "rim" of the amphitheater. 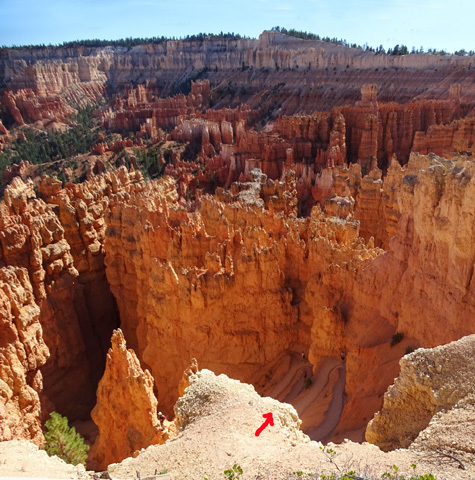 If you're acrophobic (or aero-acrophobic) you can avoid the edge of the cliff by walking on the far side of the path. 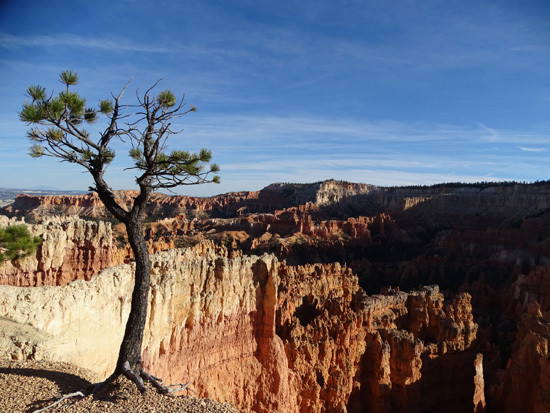 I have hiked the entire length of the rim but not all at one time. 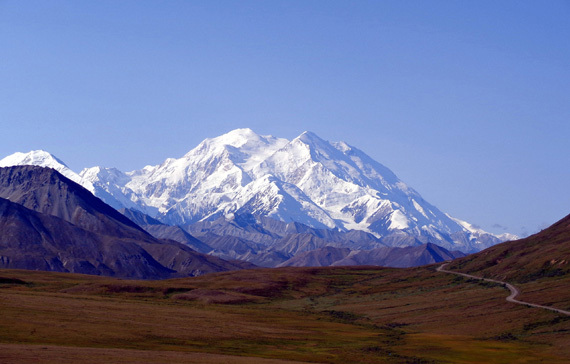 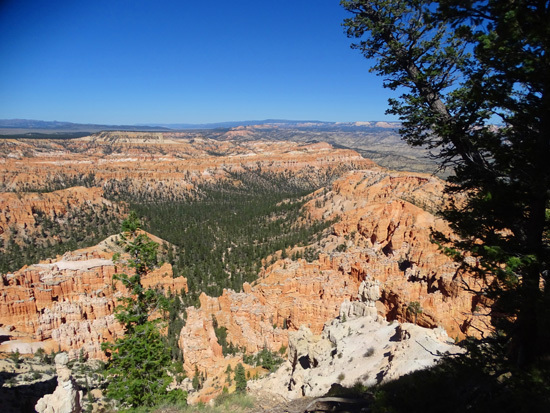 Following are some photos of the views from the popular overlooks mentioned above and the Rim Trail connecting them. 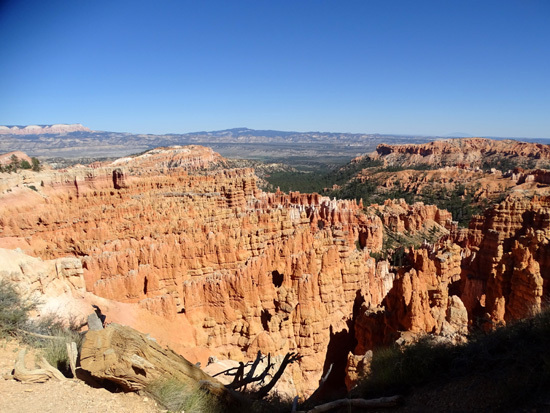 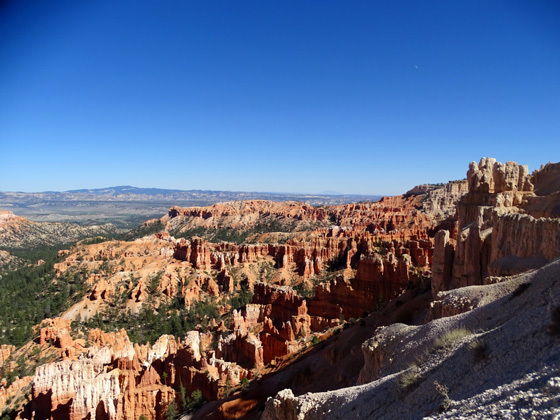 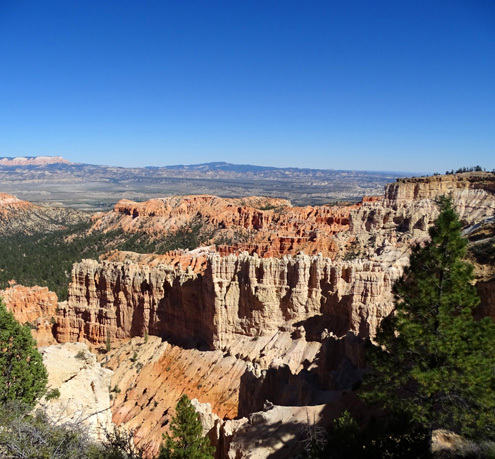 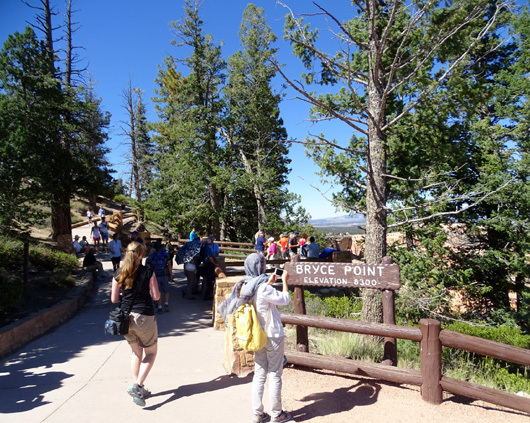 The southern end of the Rim Trail begins at the Bryce Point parking area and heads north a few hundred feet along post-and-rail fencing, then drops down to the overlook at the actual point, which juts out into the canyon. 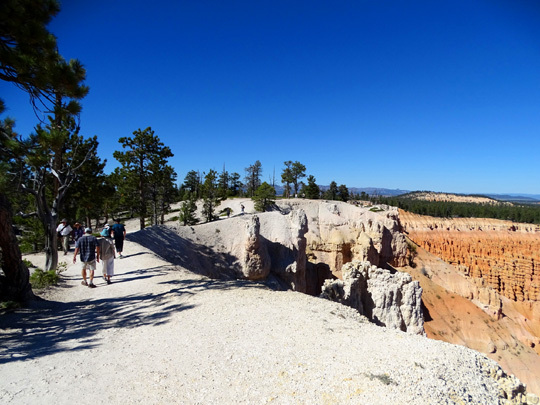 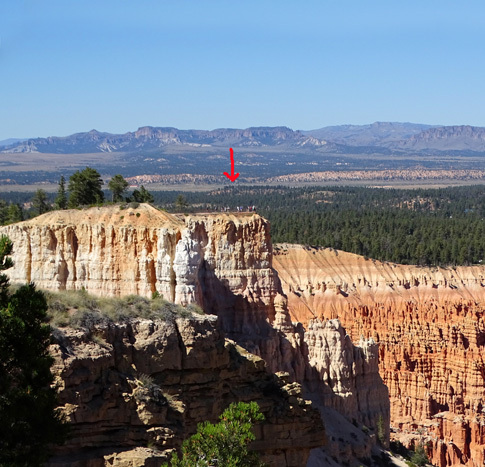 The southern end of the Rim Trail is at the Bryce Point parking area (elev. 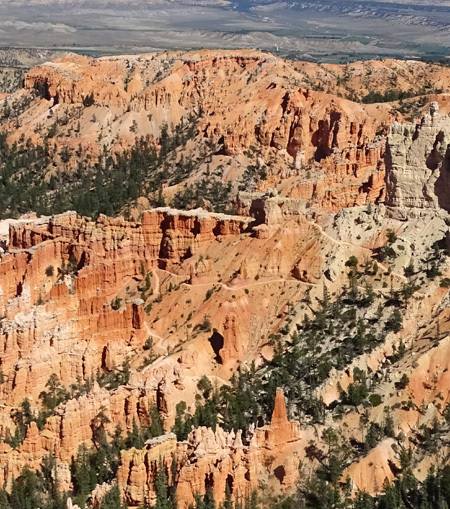 8,300 feet). 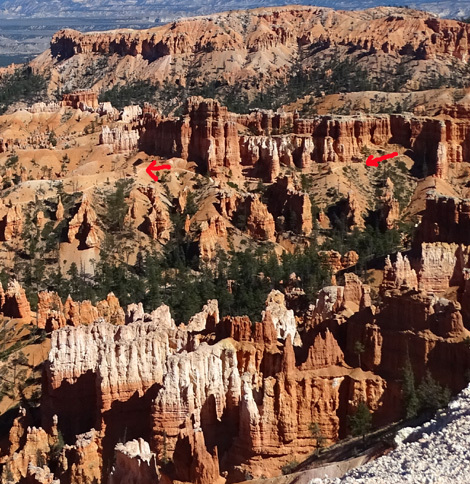 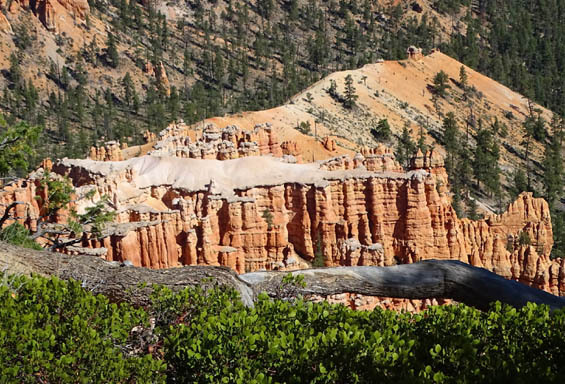 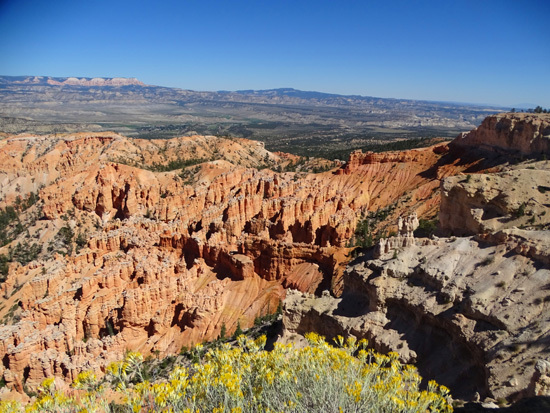 Parts of the very scenic Peekaboo Trail can be seen snaking through the hoodoos. 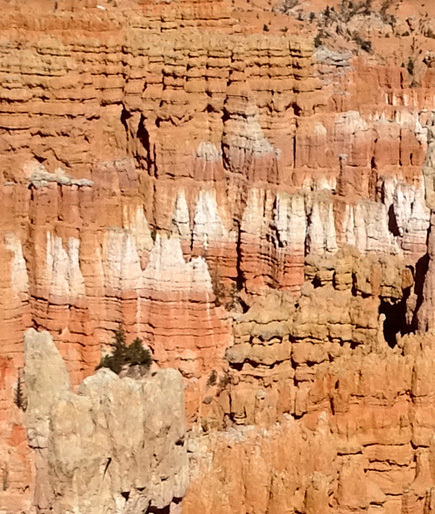 View of the "grottoes" in the cliffs near Bryce Point; the Rim Trail continues around the bend. 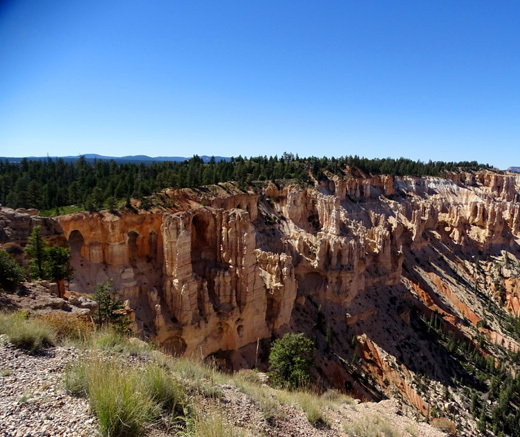 The Rim Trail is often close to the edge of the cliff. 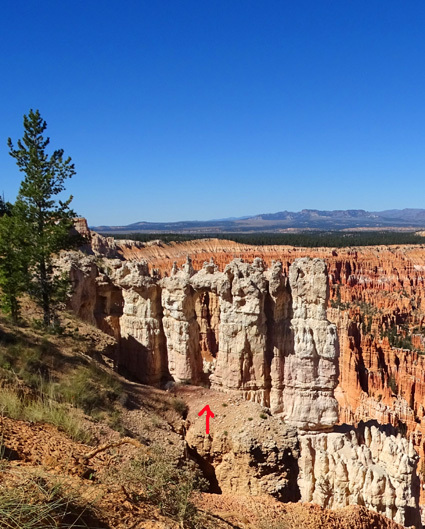 Arrow marks a large "window" in a rock fin close to the Rim Trail. 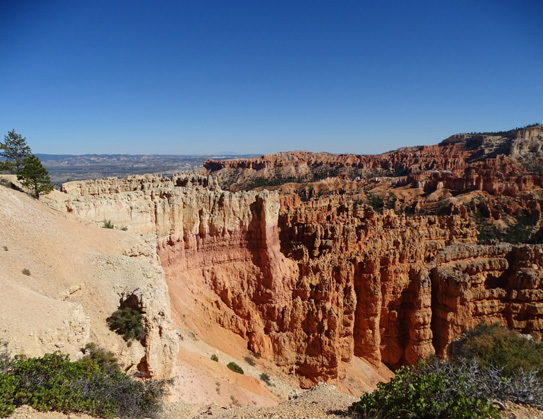 seen from below, on the Peekaboo Trail, when you can see the blue sky through the windows. 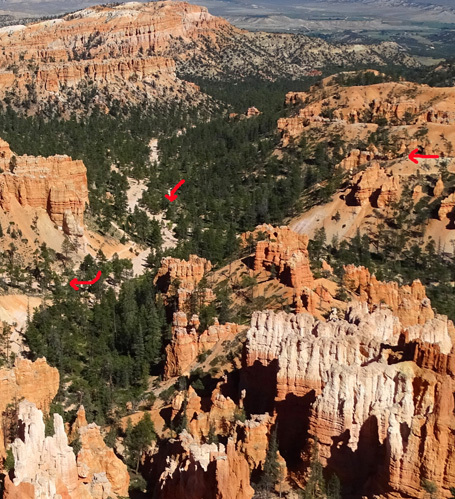 Arrow marks the upper overlook at Inspiration Point. 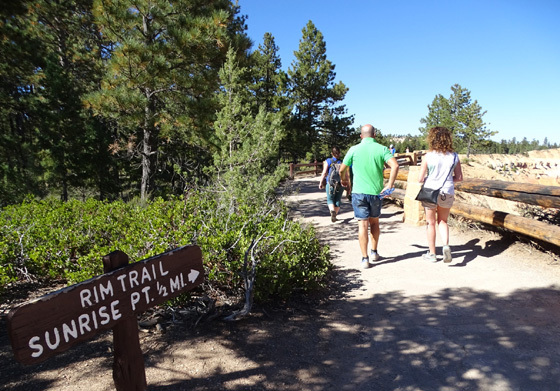 The Rim Trail goes uphill to the highest of three overlooks at Inspiration Point. 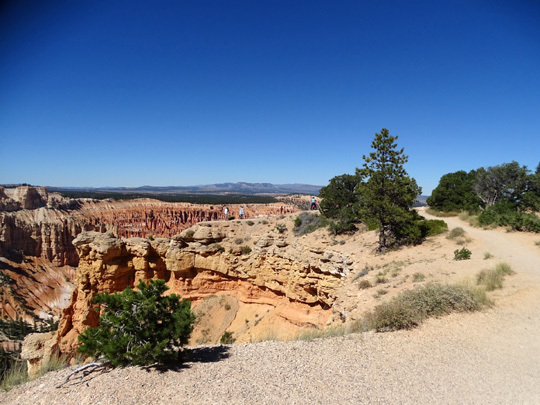 amphitheater and affords great views of the rock formations in three directions.